Right now here at the Master Business Class five of these authors are here who have books in this fantastic bundle of writing books through Storybundle.com. Kevin J. Anderson, Rebecca Moesta, Andrea Pearson, Kristine Kathryn Rusch, and me. 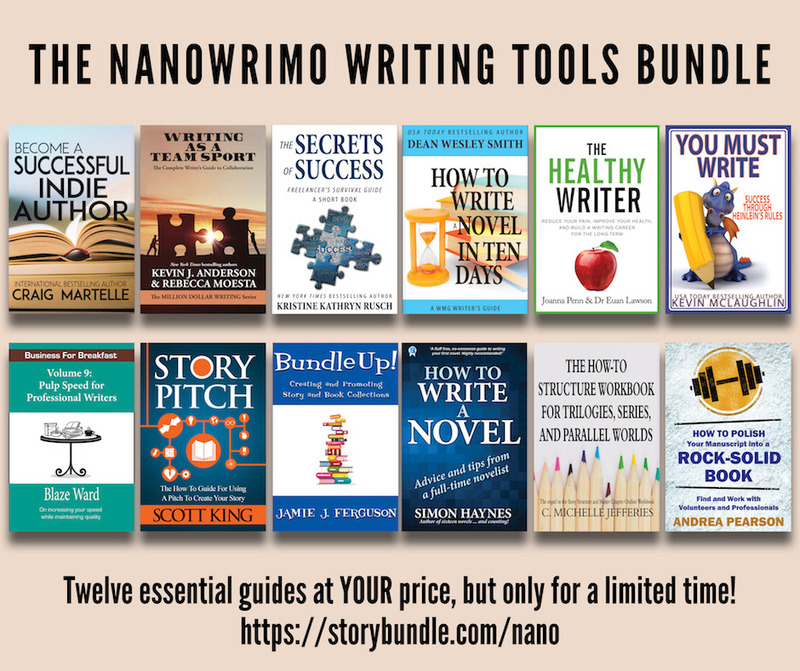 I have read or looked at most of the books in this group, and I know a lot of the authors, and folks, this bundle is a real deal. Craig Martelle from the 20to50 conferences has a book in this bundle. Joanna Pen, Kevin McLaughline, Blaze Ward, Jamie j. Ferguson, and Simon Haynes to name just a few. You folks like to keep learning, this is the bundle for you. You may not remember, but the first time I broke 40 for nine holes, we were playing together. Mark Keating is my name and that was in Moscow. I just want you to know that my stepson just wrote to me out of the blue to thank me for giving him a copy of “Carnage in New York” (I believe) and that he had lost the original and just purchased another copy. Ha! It looks like you are a busy boy. I am in Sherwood and may just make a trip over to say hello. Still in the golf biz. Take care, and sorry to burst into the business site. A blast from the (golfing) past! Welcome to Dean’s blog! You seem to have a love/hate thing with NaNoWriMo. Just a quick scan of past blog entries shows that while you love that it gets people writing, you hate the WAY it gets people to write: sloppily, rather than with a cycled-and-done draft. Do any of your how-to-write books show a page before and after you’ve cycled through it? I’m guessing not, because that would mean letting the non-creative voice into your process to remember to make copies of the pages before and after each cycle. I do wonder what that looks like, though. That’s where the revisionists have their “advantage”: they can show impressionable young writers how to do what they do because they have the sloppy first draft and then they track what changes they made. They can show their hard work to everyone so that everyone ends up sounding exactly the same as they erase the author’s unique voice from every piece of text. So, let me ask the question this way: what kind of detail do you find that you go back to add when you cycle? The five senses? Chekhov’s firearm collection? Personality notes that become important later so you have to seed them earlier? Or actual plot points because you write into the dark and when you find out what is actually going on you have to go back to be sure the earlier chapters lead up to that path? All of these things? Or am I missing the point entirely and it’s something else? And if any of this is answered in one of your how-to books, which one, so I can get that one next?